A Lodge where tranquility and nature finds its utmost expression. A special place to discover. 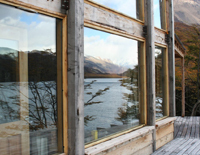 In the Argentinean Patagonia, Aguas Arriba Lodge is located by the Lago del Desierto, 37 km from El Chalten, the national capital of trekking. An exclusive and secluded place with total privacy for it's guests. On the East shore of the Lake, rests this charming place, were you can enjoy majestic views of the lake, the north face of Mt. Fitz Roy, Mt. Torre and the Vespignani Glacier. The Lodge is part of the Estancia Rio de las Vueltas, a property with 700 hectares of mountain and 900 meters of shore line, covered with centenarian trees from the Nothfagus species. 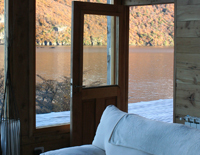 You will be able to relax in our house, a warm and rustic place in the heart of the majestic Patagonian Andes. We invite you to discover the spirit of the nature that surrounds us in this remote place. In this undisclosed Argentina, at only 5 km of the Chilenean border, accessible only through the lakes or hiking in the forest, it is common to see only our own shadow or the ones coming along. 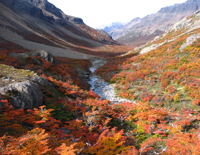 Trails that haven´t been explored, rivers, glaciers, forest and lakes. An ideal place to start a variety of hikes, fly fishing trips, to harmonize with nature, relax, meditate, read, enjoy the fresh perfumes and the wild sounds from the main deck overseeing the lake. We respect and take care of the environment, far from the chaos of cities, immersing into nature and adapting to it in the character of a guest. 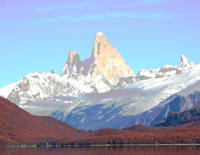 We want you to experience our hospitality, our house and the Argentinean Patagonia.